Join us for a Bank holiday Bonanza! These really are truly unique sessions and they are led by the incredibly talented Liam Broderick. Join us on Friday 24th August 2018 at 7.30pm as we hit the Pentire Headland at South Fistral to break a sweat to this fun dance fitness workout. We will be treated to a beautiful sunset as the class progresses, then as the light dims, the class will start to glow. Glow in the dark clothes and retro fluro headbands welcomed and encouraged! We will be strutting our stuff on The Kraken Pitch and Putt course at the far end of Pentire Avenue where we have found a great spot just over the brow of the hill which has a panoramic view of the ocean, yet it is still nicely secluded and private. We believe this is one of the most beautiful spots to view the sunset in Newquay. We encourage you to arrive at 7pm to allow time for unexpected holiday traffic, get parked, find us and go through the check-in process. Free parking is readily available in the Pay and Display carpark at the end of the headland which only charges until 6pm. If you live nearby then please do hop on your bike and cycle or walk on over to us. Join us at 7.30pm for one of the most exquisite yoga sessions we offer on our yearly calendar. This is the event where all the elements marry up and we get to practice yoga at sunset with the tide lapping at our feet. Picture dramatic, fiery skies spreading overhead as you build through the vinyasa yoga class listening to classic Ibiza hits. The pinnacle of the class is finishing with the sun touching the ocean just as we come out of the final meditation. That is a magical memory that will last forever! The all levels vinyasa flow class will be accentuated by wearing headphones and immersing yourself into a musical journey as you practice – don’t worry, the headphones stay on! You will hear the teacher crystal clear through your headphones as their voice is overlaid on top of the music. The postures are choreographed to the varying rhythms of the upbeat playlist and it is our intention that the session will leave you feeling uplifted and ecstatic. Beginners are very welcome and there will be easier options offered throughout the class to make it suitable for all. This the third of our weekend of events will see a more restorative, chillout vinyasa class. 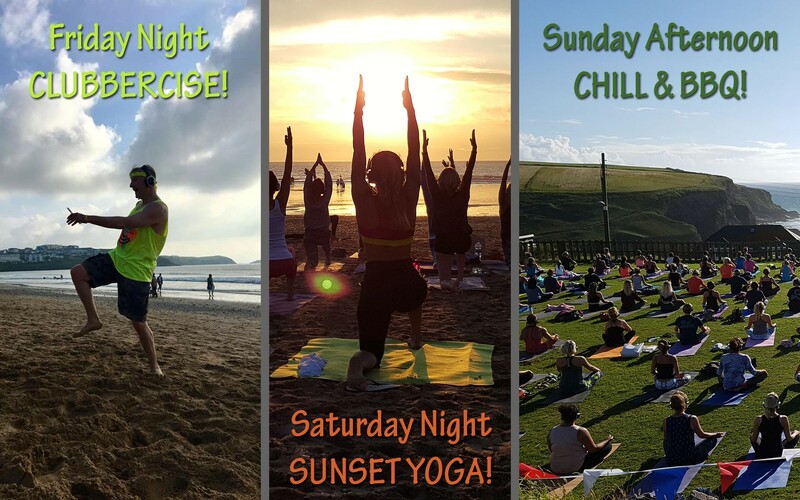 Join us at 4pm on the breathtaking lawns high above Mawgan Porth to practice a slow flow yoga class to some classic chillout beats. The perfect recipe for a lazy Sunday by the sea. The practice will finish with a Yoga Nidra meditation to ensure full body relaxation. Suitable for all abilities, beginners are very welcome. GOT KIDS? No problem we will be running a fun kids yoga class alongside the adults class to keep them entertained. This will be taught by the experienced and fully qualified kids yoga teacher Hettie Whitaker from Little Yoga Warriors. This class will be suitable for 4-8 year olds. It will last approx 45 minutes and will be then be followed by a KIDS Silent Disco whilst the adults finish their class.